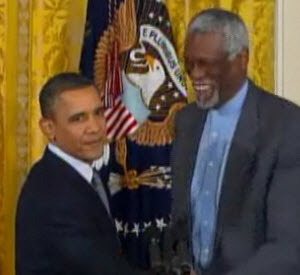 Bill Russell received the Medal of Freedom yesterday in Washington D.C. Depending on how old you are you may only have memories of Bill Russell as a historic Celtic basketball player but over time he has become even more than that. President Obama made an interesting comment about Bill Russell having a statue put up of him in Boston. Looking at his accomplishments it would seem like something that should have been done long ago. Sadly the debate has been shaded by what was perceived to be anti-Boston sentiment by Bill Russell which when you look a little deeper you see that experiences in Boston were shaded by events that he perceived as racist(some legitimate and some maybe not so). As someone who was born and raised in Boston I have spent the last 40 years seeing both sides of the racist story. Was Boston a racist city? All I can say is there definitely were many in the majority that did not look fondly on the growing African American and minority populations. As time has progressed you can definitely see a changed Boston but as with any major city in the US some levels of racism exist. Racism not only obviously hurts its victims but sadly it also may shade their perceptions of events and even innocent comments. As a minority I know that there are times that you have to take a minute to think about your reactions when harm may not have been intended. In his later life it appears that Bill Russell has accepted that Boston has changed. Whether when is jersey was retired at the Fleet Center or when he was honored by Mayor Menino you can see that not only has Boston grown as a city for all but Russell also has allowed time to heal some of the older wounds he received in Boston. I think a statue would be a great way on not only honoring Bill Russell but also a way to have Boston continue to move on from some dated impressions.